Don’t let the title of this post fool you into thinking that the hat in question is dead. It is very much alive and well (unless you count Faire-sweat). The point is how it came to be. I’ve long enjoyed being a peasant at the Renaissance Faire. Who doesn’t love the irreverent attitude, the ability to wipe your dirty fingers on your clothes (you quickly get over the fact that you are ruining the costume you labored over – those are marks of good times had, not stains!) and the occasional peasant pile? Those noble looking tall hats have long intimidated and intrigued me. As my guild slowly moves up in standing from lowly peasant to something like lower middle class, we’ve all started looking at things that actual Renaissance Sumptuary Laws and social standing would have prevented real peasants from having. A tall hat meant status. It’s no Pope’s hat, mind you, but the only tall hat a peasant would have gotten their hands on would have been tattered and almost unrecognizable as headwear. Our new Lord Mayor and Sheriff both needed a tall hat. 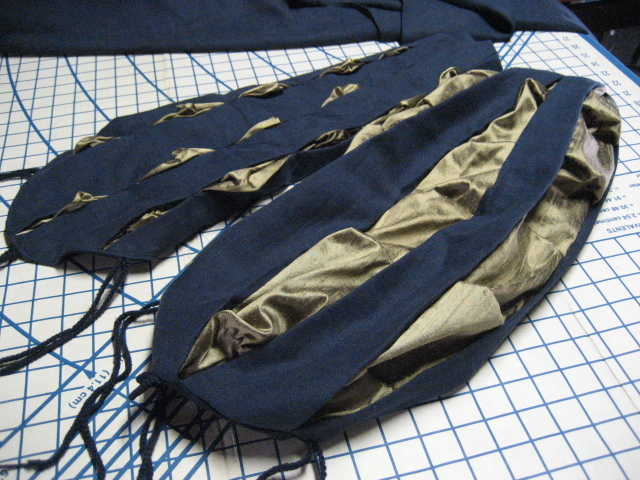 As with any other costume piece, there is a lot of variation on the theme when it comes to the exact size and shape. Look here, here, and particularly at period portraiture. Our two men wanted hats that weren’t too tall and brims that were big enough to shade their eyes. 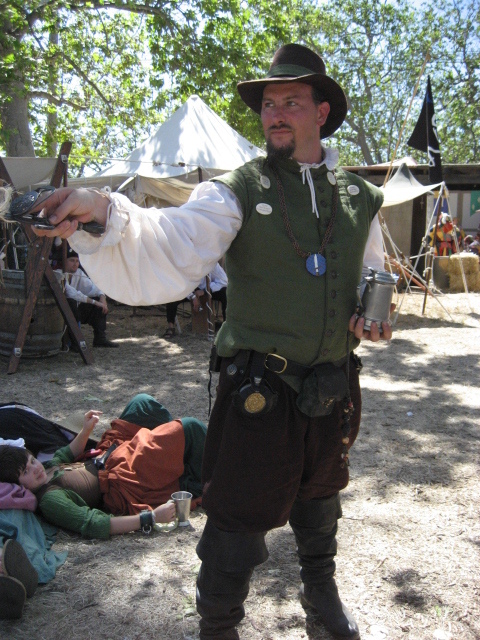 Unlike Elizabethan England climate, the CA Ren Faire is full sun and 95+ degrees 95% of the time. There were particularly fond of a leather version we had seen, but I was hoping to give them something cooler and opted for the linen of their doublets. 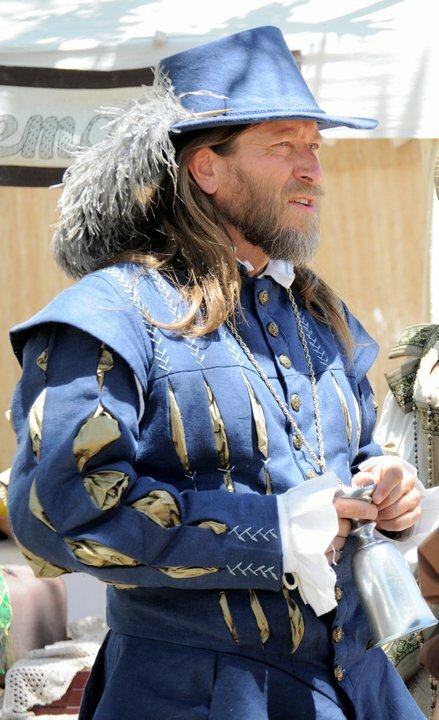 This costume (and our Sheriff’s) was all about designing everything I ever wanted into a man’s Elizabethan costume (as well as putting the man in said costume) without going overboard. Tristana suggested linen for its breath-ability, look and durability. We settled on dupioni silk for the slashes as a way to notch up his look without the ostentation and inappropriateness of something like velvet. 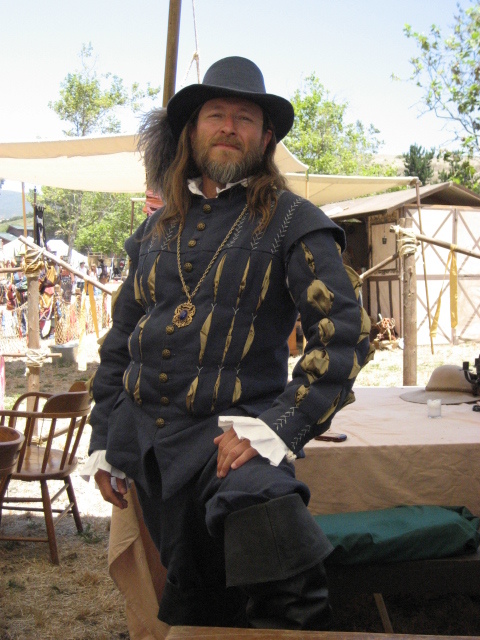 We chose the cobalt medium weight linen from Fabrics-store.com for it’s great period color (any blue that denim fades to is usually acceptable at a ren faire) and a tea green silk for – well, because the Rogues like those colors and our Lord Mayor looks very nice in them. We were plagued by a series of silk setbacks, substitutions and near panic-attacks, but finally substituted a sort of olive-green that went perfectly with the brass buttons we chose. 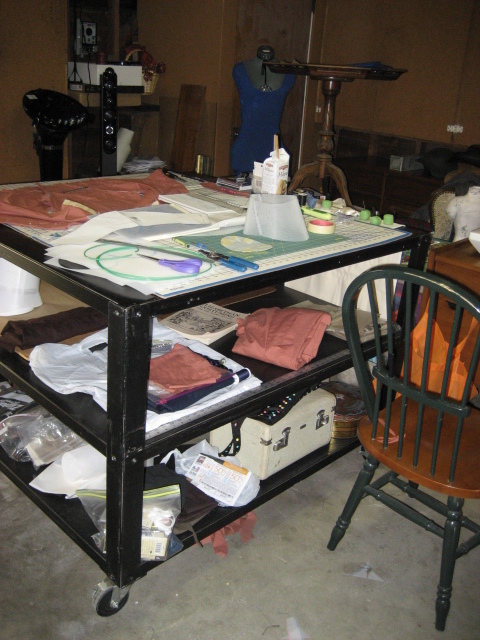 The process for this costume started with research in books of period costume, period paintings (particularly the ones Fabrics-store.com just posted on their blog), and sketching out different color combinations, designs and details. We finally settled on a design that kept things pretty simple with a yoked doublet, slashed chest and sleeves. The hat was to be of the silk until I came to the realization that the slubby texture in the weave of the fabric would require that it be placed on the hat in a scued fashion and, while that might look great on a modern hat, I didn’t like it for a period effect. The hat was changed to linen. A deconstruction of the hat will be forthcoming. The next step was an initial mock-up constructed on a basic block pattern, followed by adjustments, another mock-up, slight changes and finally a clean pattern. 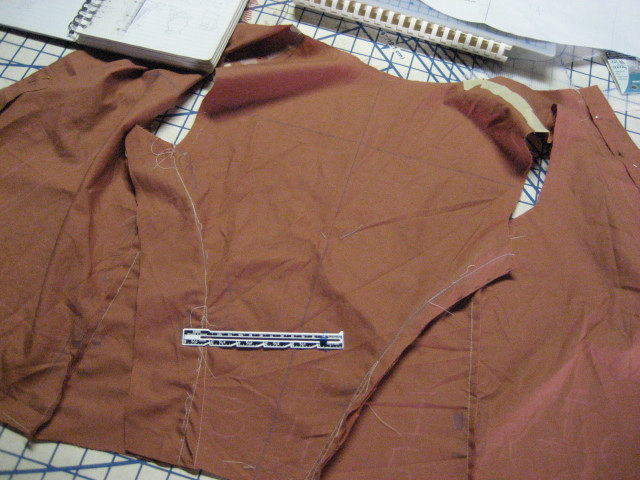 Small adjustments were made on the lining and interlining and a mockup of the standing collar, skirting and epaulets were added. Then the fun began with the cutting out of the actual linen and silk. In the past we’ve used the word peacocks to describe the men in our creations and this time is no exception. The Lord Mayor and Sheriff of the Central Coast Renaissance Faire, or SLO Faire (July 16 and 17, 2011), were preening, strutting and looking damn good, if I do say so myself, in their fyne new costumes. The Lord Mayor’s costume is a dark blue mid-weight linen doublet with yoke, sleeves and pants with a fine cotton flat-ruffed shirt. The sleeves and doublet front are slashed with green dupioni silk and trimmed with blue-gray hand embroidery and antique brass buttons. His tall hat is made from the same linen and the hat band is hand made blue cotton trim. 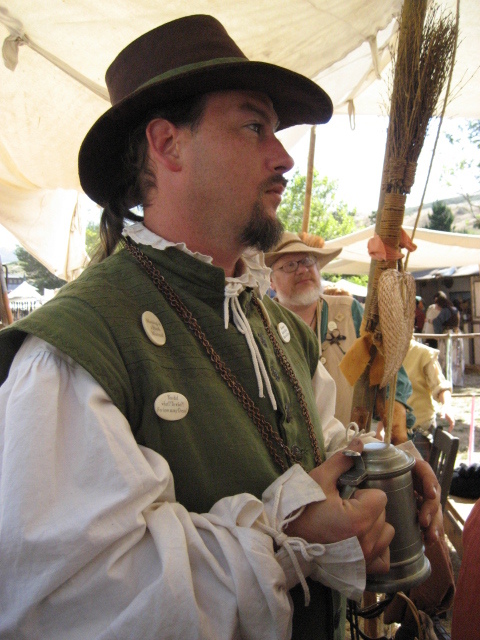 Our Sheriff’s costume is a green doublet of mid-weight linen, heavy weight brown linen pants and a cotton flat-ruffed shirt. The doublet is yoked, as the Lord Mayor’s, but that portion is pleated and embroidered subtly with a vine pattern in brown thread. The buttons are antique brass. His tall hat is made of the brown linen with a green linen hat band with the same embroidery as the doublet. The hat and doublet patterns are Rogues of Thread originals. A special thank you to M for finding the time I had lost to make the Lord Mayor’s shirt. You saved me! These hands have not been idle, not entirely. It’s June and we’re in the middle of two custom Elizabethan middle class costumes, one for the Sheriff and the other for the Lord Mayor. Linen and silk, cotton embroidery thread and antique brass buttons. Doublets, sleeves, breeches, shirts and hats. Slashes and pleating. 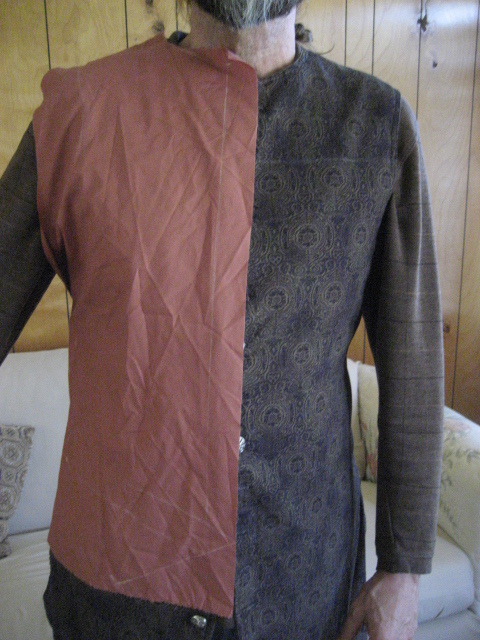 The hat and doublet patterns have been created, the measurements taken, fabrics acquired. Now it’s time to get started.